‘Wait, what? are you sure it’s in Pluit? I only knew there’s a lot of nice Chinese/Medanese food around Pluit. Surely not Japanese’ It will be more believable to have a nice Fried Kwetiau in Pluit area. Haha. ‘Ohh, okay. Sure.. See you Sunday girls.. ‘ I still replied with my unbelief. And there i was, driving after a church service.. and suddenly found rather different signage around the street. I parked my car just in front of the restaurant, and to my surprise, i saw a nice restaurant that’s quite different from it’s neighbours. We mentioned that we already have a reservation for that night, and the waiter professionally escorted us upstairs to our designated seat. They passed us the clean ‘japan-ishy’ menu with no pictures at all on it. Every time i visit a new restaurant, i often asked the waiter on what’s special on their menu. and the waiters here can fully answer in detail on each menu that we asked. Not bad at all for Pluit Area, normally i can only get this kind of service in those fancy cafe in North/South Jakarta. It’s one of their signature. Love the tempura set that served with the glazed rice. Crispy but not greasy, so it wont hurt your throat. as for me, i asked for extra tempura sauce, somehow i like a bit soggy-kind of tempura. I know it looks like a salted egg chicken. But it is not, it’s melted cheese mixed with sliced chillis, and it tastes soo good! The sauce is really the bomb! As for me, it’s just a normal beef bowl, with a very tender sliced glazed beef. (Goma cake) – Rp 45,000. Nice black sesame cake! The best-seller cake in the house. The sponge cake is so soft and not so sweet. Quite a unique taste i must say. The most sinful piece to end the day. They are using dark chocolate and rhum to balance the sweetness of red velvet. Overall it’s a nice dining experience. Nice ambiance, great food, friendly waiter, and great company! And ohh, they have limited baby chair though. So i dont recommend a bunch of young moms to hangout here. We waited for more than 40 minutes just to get one baby chair on non peak hour time. But still recommended for small groups of friends and family. They have omakase menu as well if you crave for one. After suppressing my hunger for noodles, I finally could not resist it anymore and start to eat noodles again. But this time i limit myself to once a week. So, this past few weeks ive been going to many noodle places, from local noodles, pasta house and japanese ramen. and guess whatt.. The Japanese Ramen won my heart! They have 4 types of Ramen Based that you can choose from. The Original , The Spicy ones, The Squid Ink-ed ones, and the Seaweed ones. What i love the most from this place is you can choose your noodles thickness, your broth thickness, your type of meat and vegetables, spiciness etc. I just love ramen places that can be customized. *Red King (Akao) – This bowl of red noodles really won my heart. Well, maybe because i love spicy food in the first place, and this Akao has satisfied my taste buds. I chose normal for the richness of taste, normal special sauce, light garlic, shoulder parts for the pork meat, green onion for the vegetables, level 4 of spiciness (you can choose level 1-10), and thick normal noodles for my ramen. And i loveee thiss so soo muchh.. The thickness of the noodles is not that thick as i expected, but it’s chewy enough for me to enjoy. The broth itself is a bit salty and spicy at the same time, since i love both, so the soup are just perfect for me. Love the shoulder pork-meat as well, cause when most other ramen house use very thick cha siew (shoulder pork meat), they use thin sliced that makes it less fats and they are pretty generous in giving the meat. Really love it to the bits. They have many options to choose from (Original Tonkatsu, Soya sause based and spicy based) and they can customized our bowl of ramen as well. Even though i love spicy noodle so much, i decided to skip it this time. Why so? Because they mixed the spicy broth with some seafood based soup. So this time i play it safe and so satisfied with my Original Tonkatsu based soup. Quite a fan of Japanese Gyoza, but i found this one is just normal towards not-so-good-for-my-tastebuds. So, if you are not into Gyoza, you can skip it. They have the normal spicy based soup and sort of special edition spicy soup with some prawns, and other types of pork-meat. My friend chosen the later one, and it comes like this. Looks so appetising, but she said she prefers the original better. So original wins for this Ramen shop! I do not mean that i fancy those raw meats that they are serving. well.. i do eat the grilled jap food, the teriyaki, the katsu and all the ‘don’..
i also eat raw fish.. eventho it’s very limited.. only Salmon Sashimi and Tuna. hahaha.. 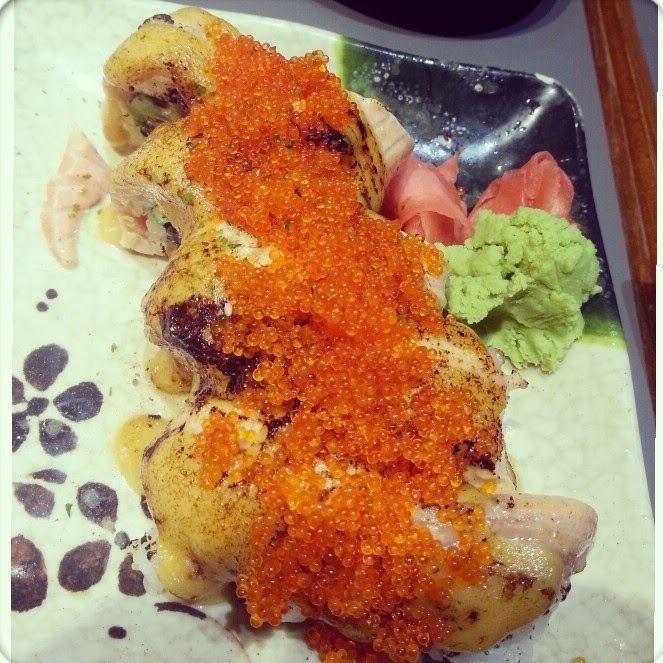 So, why can I claim that i love Japanese food? Normally they call it ‘Maki’ – like what it has always been written down in all Japanese menu. haha..
after googling around.. ‘Maki’ is a rolled sushi with seaweed nori, which you can put anything that you like inside the sushi..
and below are (My) 3 Best Maki in Singapore (So Far) hehehe..
but let me just post it again 1 more time over here..
who does not know this, right? 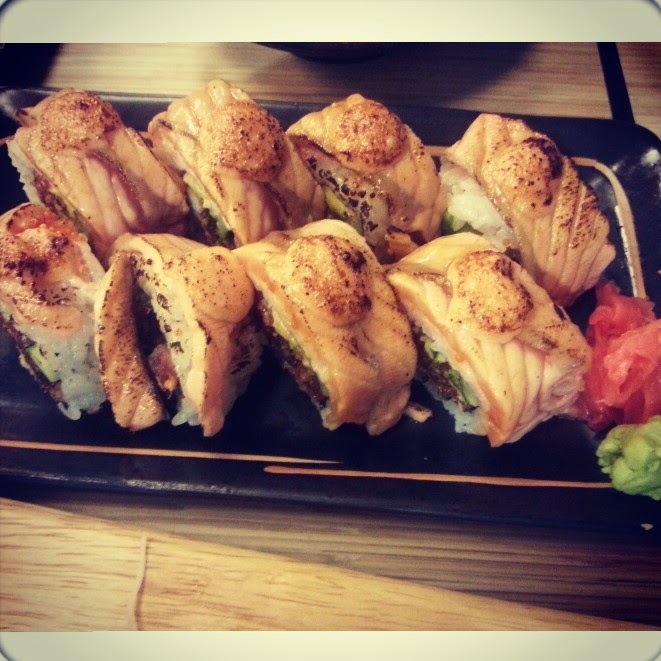 but for some of you who does not know this yet..
ill introduce you, the SHIOK MAKI ! the perfectly matched make melted cheese, mayonnaise, mentai and miso maybe? hahaha..
this is just too hard to resist..
but you really have to come here on odd hours.. else, goodluck q-ing for god knows how long. Singapore 238877Open everyday ( as i know ) hehe.. The Queue at this rather small restaurant is as crazy as KOH Grill. 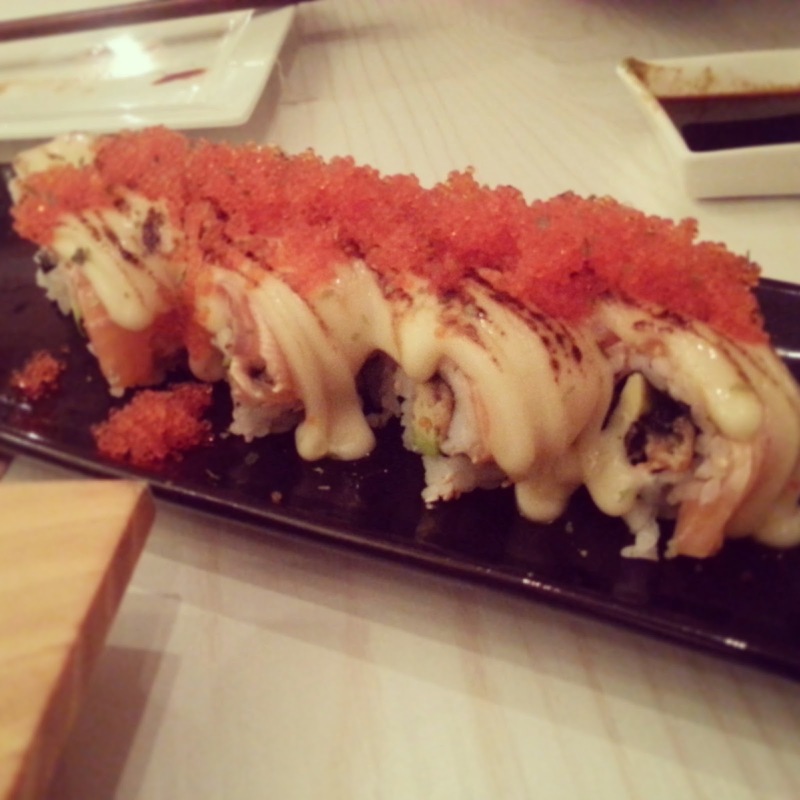 One of their best seller is the Salmon Aburi Sushi. as the sauce lover.. they do not ‘drench’ the sushi with the sauces..
hence, they just put a little bit of the mentai on top of the maki and burnt it a lil bit. i love the burning smell that comes out from it.. haha..
i think this is one of the best maki in Singapore..
my favorite is the ebi fry salmon aburi sushi. hehehe..
well, compared to Shiok Maki.. i can eat more sushi here..
maybe because the sauce does not makes your stomach queasy easily? 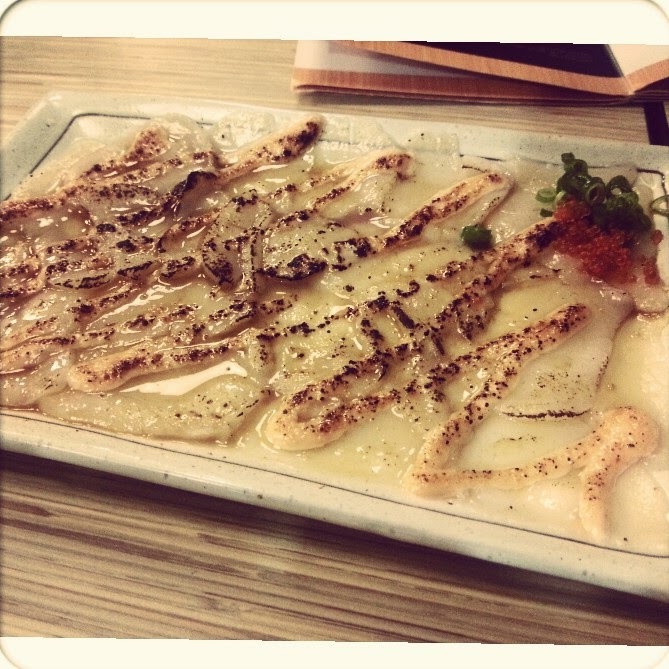 *aka : eneg* hehe..
ohh.. when you are in Sushi Bar, you really need to order their scallop mentaiyaki ! this is really ‘da bomb!’ hahaha.. Thanks to Bern’s sister who introduce this to us.It’s a fusion kind of restaurant, whereby you can found Italian-Asian, North-Indian cuisine and Japanese! 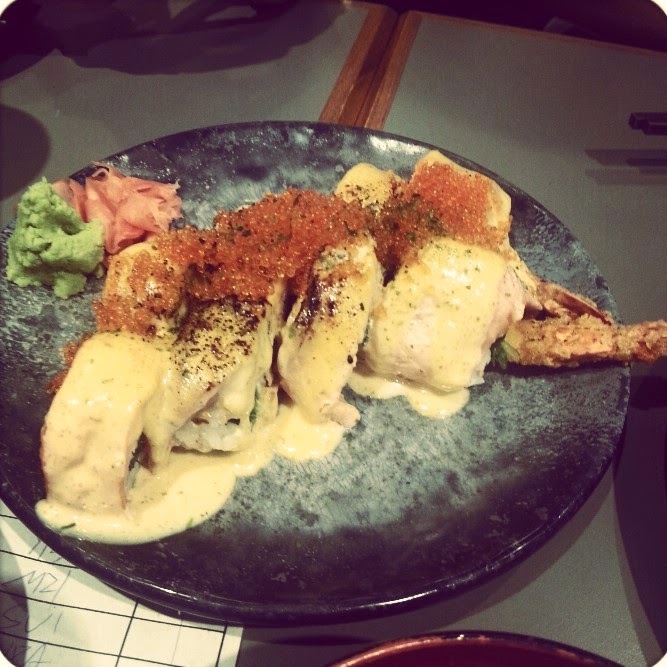 if Koh Grill and Sushi Bar is located in Orchard Area, this one is a little bit bar..it’s in east coast side. 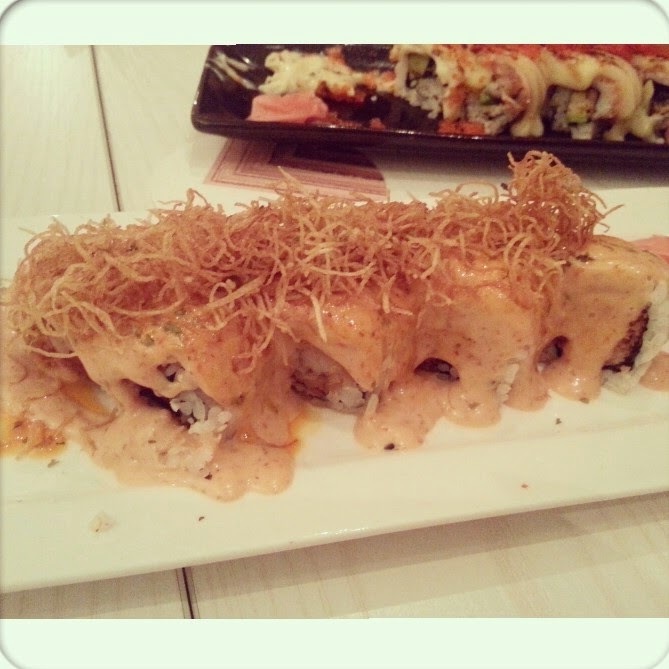 okay.. now, let me show you the Maki that can make you droll all day long. – Oishii Maki – unagi, roasted salmon, avocado.. and of course the super delicious homemade mayonnaise that i dont really know what it is really made of. hahaha. Please do let me know if there’s more awesome ‘Maki’ in town okayy.. hehe.